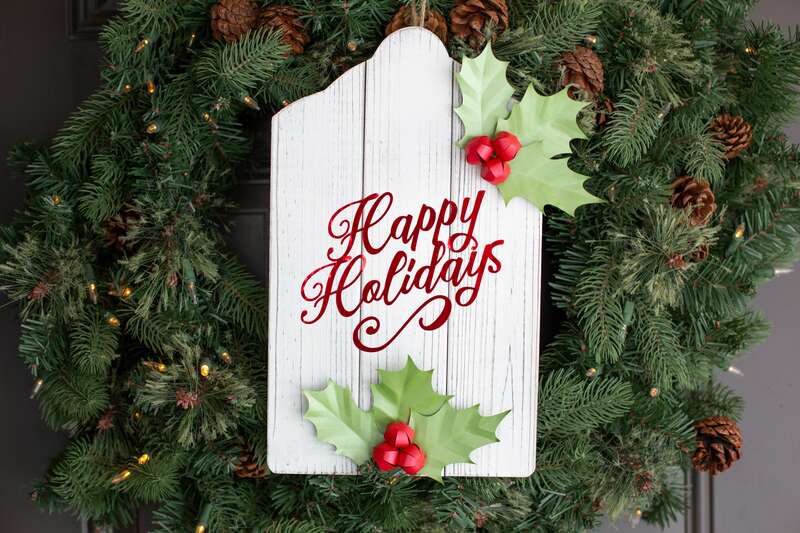 Dress up a wood plaque for the holidays by using some sparkly metallic vinyl and some paper holly berries. Keep reading to see how easy it is to make! 1. 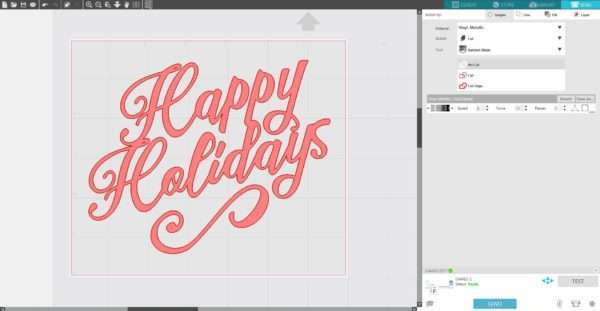 Download the Happy Holidays design (Design ID #168121) from the Silhouette Design Store. 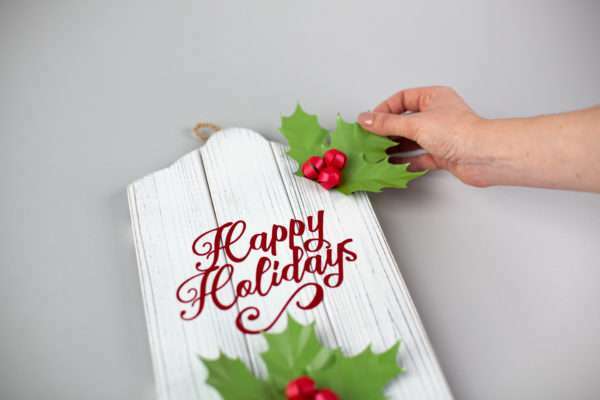 Open it in Silhouette Studio® by locating it in your Library, and resize it so that it will fit your wood plaque. 2. Place pieces of metallic red vinyl on the cutting mat on the same spot as you placed design on the working space in the Silhouette Studio®. Make sure the piece of vinyl is not smaller than your designs. Adjust the rollers if needed, and feed the mat into the cutting machine. 4. 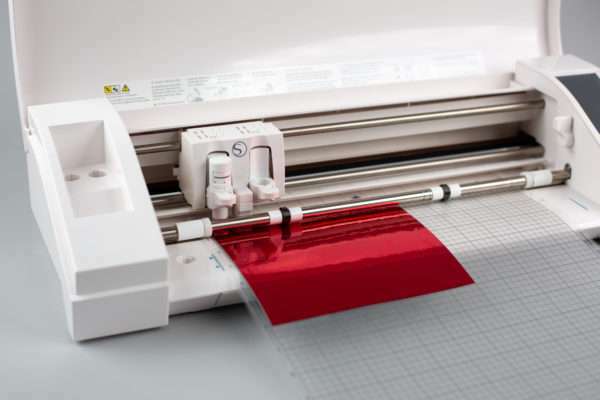 Once the images are cut, select Unload on your machine and remove the vinyl pieces from the cutting mat. 5. Weed (peel away) the negative space so all that remains on the vinyl backing is your design. 6. Place the transfer tape over your design to help move your design over to the plaque. 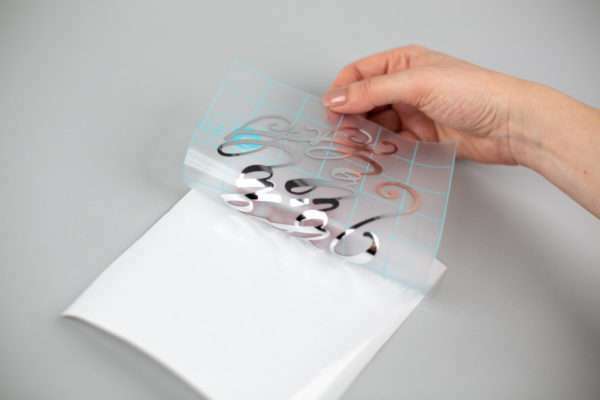 Use the scraper tool to adhere the transfer tape to the vinyl. 7. 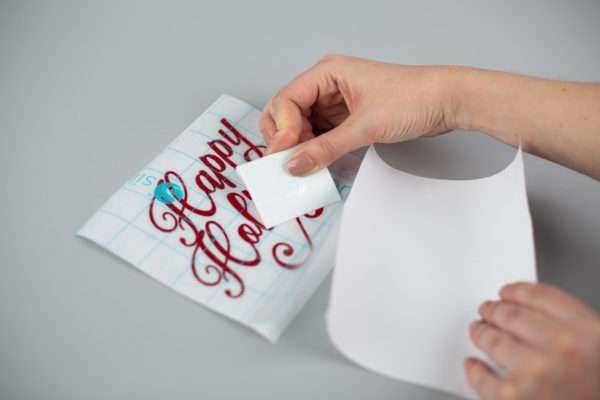 Slowly peel away the vinyl from the white backing. If parts of the design are not adhering to the transfer tape, place the design back on the white backing and try adhering the design again. 8. 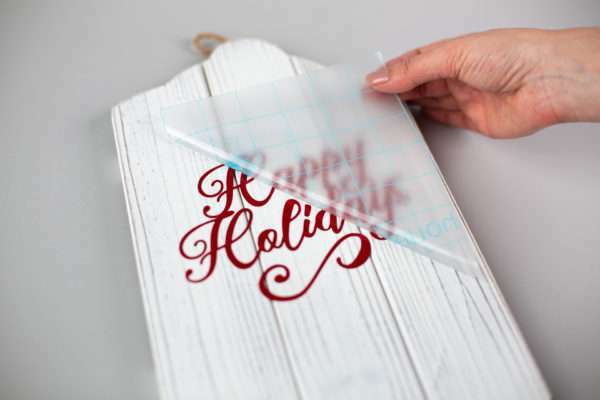 Apply vinyl on the plaque, and slowly peel away the transfer tape to reveal your vinyl decal. 1. 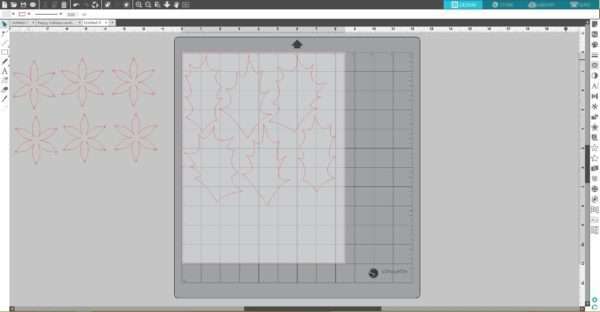 Download the 3D Holly design (Design ID #282059) from the Silhouette Design Store. 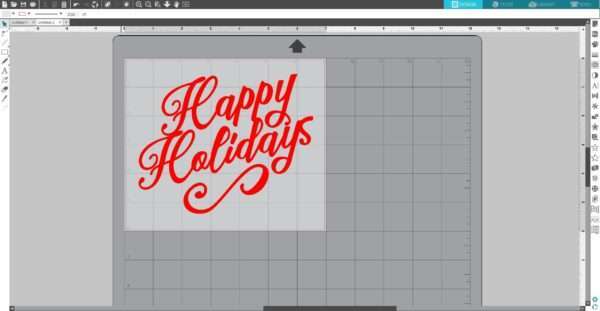 Open it in Silhouette Studio® by locating it in your Library. Place the leaves in the cutting area. 2. 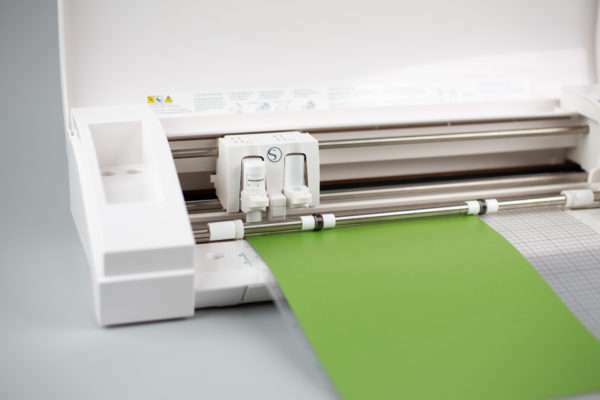 Place a sheet of green paper on the cutting mat and feed it into your Silhouette machine. 3. In the Send panel, choose “Copy Paper” as your material type. Adjust your blade if necessary and send your cut job to your Silhouette machine. 4. 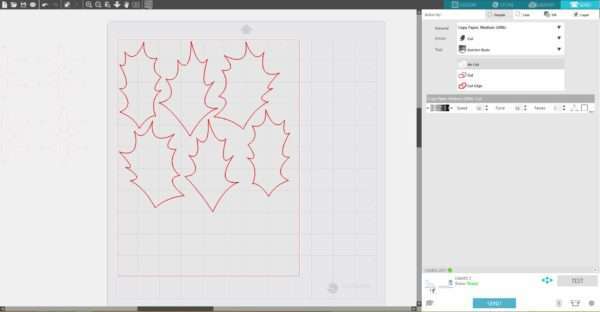 Move that group away from the cutting area and repeat the same process with the berries design. 5. 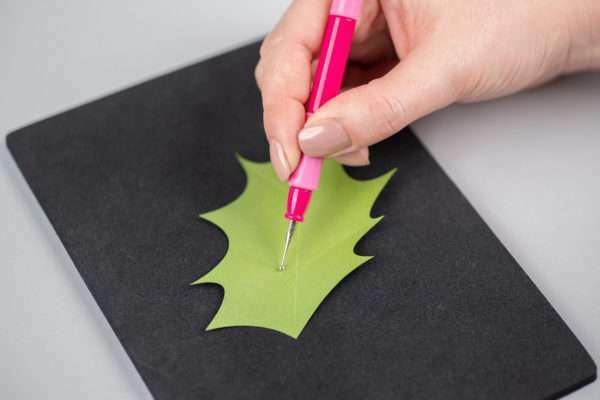 To shape leaves, place the leaf on the embossing mat. 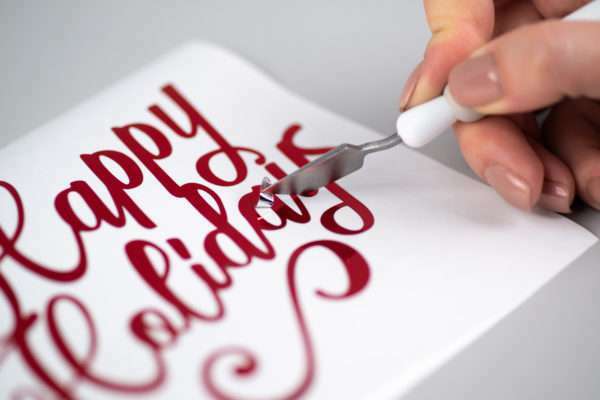 Using the flower shaping tool or Silhouette spatula, add relief (or create a raised pattern) to the leaf. 6. 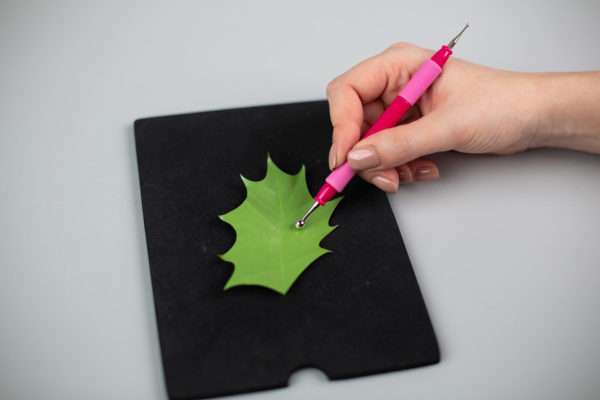 Using a flower shaping tool, add curl relief to the leaves. 7. Curl berries sections with the handle of the a tool. 8. 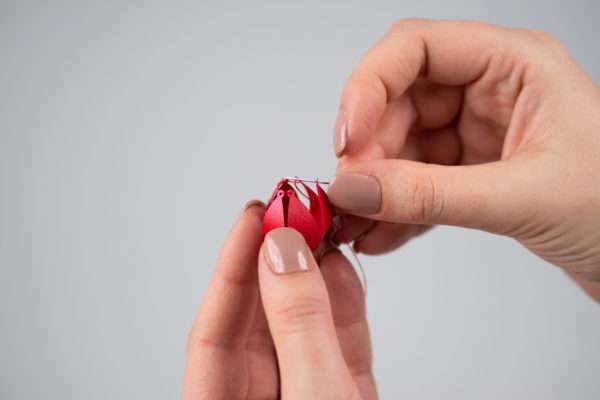 Use a needle with thread to assemble berries. 1. Glue the leaves and berries on the wood plaque. 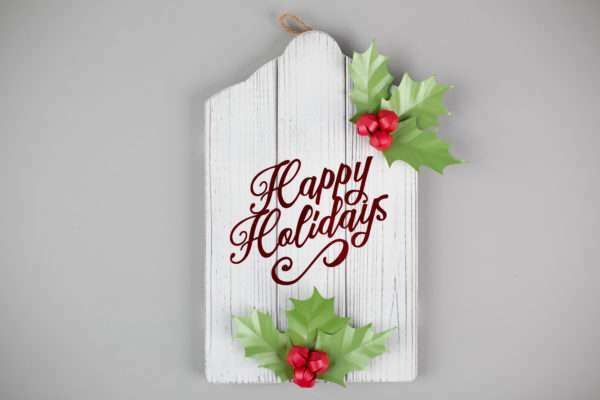 These designs help turn a simple plaque into a beautiful sign that is a perfect display piece for this time of year. Tell us in the comments below where you are going to display your sign!